My expectations of this live album were quite high. I was standing in a muddy field in a pouring rain back in 2009 and watched these giants play the crap out of everyone, who were there. A magic night and one of the coolest concerts I've seen. It happened in the small village called Kilafors at the now-bankrupt hard rock festival Rockweekend, they had in an incomprehensible manner gotten one of the world's best super-band as the main attraction! Chickenfoot is as information, if you aren't familiar; a project with Sammy Hagar (ex-Van Halen) on vocals, Michael Anthony (ex-Van Halen) on bass guitar, Chad Smith (Red Hot Chilli Peppers) on drums and as the tour drummer (when Chad is busy with RHCP) they have Kenny Aronoff and of course the awesome and magical guitarist: Joe Satriani! Sammy once said: "We’re not a super-group, we like hanging out together and the music is a bonus". They have great fun on stage and it rubs off on us in the audience, and this disc gives me my beautiful memories back and the pleasant joy of playing they give and it ends on a disc that really has the right live feeling. With only two studio albums in their backpack, the selection of songs is limited, but I like the debut album and specially 'Down the Drain' and 'Turnin' Left'. Satch has big space to show off and shine. Mr. Hagar is still a great vocalist and is the motor and the front man, who lead the band forward and pushes the other guys to give all they got on the stage. 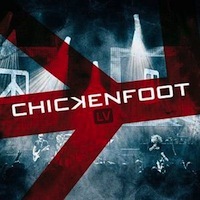 Most of the tracks are much longer on "LV" than on the studio recordings and if you like Chickenfoot's former releases or if you, like me, has been a lucky soul and has seen them live, then this is a nice disc to have as a reminder. Almost an full hour of sharp riffs and groovy rhythm songs is what you get on "LV". Tracks 1-4 is from 2012 and from their Different Devil tour in Seattle, Chicago and Boston. Tracks 5-9 is from 23'rd September, 2009 and the concert in Phoenix. I recommend you to wait until 2013-02 and the release of the complete box with I+III+LV (3CD+DVD). But if you can't wait that long, it's OK to get this disc right now!